History of the Pilates Method The founder of the Pilates Method, Joseph H. Pilates, was born in Germany in 1881. His philosophy of body conditioning is considered visionary in the eyes of many people. In childhood, Pilates was frail and unhealthy. Those early health challenges seem to have sparked his motivation. In a quest for vitality, he studied many physical disciplines including: martial arts, fencing, wrestling, diving, and yoga. He trained his body with focus and precision, applying the wisdom of these many disciplines. Ultimately his lifelong research culminated in the Pilates Method. 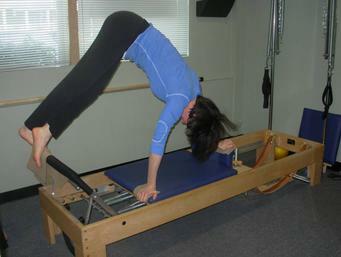 Core strength is a popular concept in fitness today and has always been key to the effectiveness of the Pilates Method. Joseph Pilates called it the powerhouse, instead of the core but both terms refer to the muscles of the trunk (which support the spine) plus the muscles involved in breathing. A strong core (aka. an engaged powerhouse) feels like being supported by an internal, muscular corset. Core strength results in a feeling of being lifted and elongated. If there has been compression to any spinal nerves due to poor posture habits, this pressure can be greatly relieved through the newly awakened (or re-awakened) core connection and improved structural support. This is one reason the Pilates method is often recommended by healthcare professionals to minimize or possibly alleviate back pain.